Owned by William and Mary White in the c17th and described as "all that messuage or tenement with the closse croft orchard garden 'thereto adjoining'..situate in Quorndon". The property remained in the ownership of this family for three generations and over a century. In 1781 it passed to a nephew of the White family, John Gretton. In 1787 Mrs Elizabeth Laxton, widow, agreed to buy the property already in her occupation. Later Elizabeth married John Earl and it is in the conveyance of the property to Mr and Mrs Earl that it is described for the first time as the White Horse. 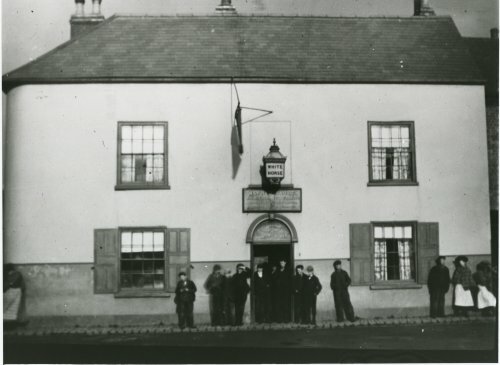 The pub has frequently been subject to flooding and, in 1875 a man was drowned on the premises. In 1878 permission was granted to build shops and three cottages on the site of the old stables. Since this image was taken, the building has had mock todor cladding added in black and white, and the doorway shown has been moved around to the left side.